The new firmware update 2.10 has seen some welcome new features including DivX and WMV playback and voice changing functions when chatting but one feature which isn't documented is the new 'visualization' mode when playing music. I have always liked the wavey visuals in the music player, a bit like a suped up WinAmp plugin only with softer blending, smoke-like effects and strange floating blocks, but I had always hoped there would be new ones released. The new 'Gaia' visual effect is absolutely stunning. You can access it by playing a music track and pressing the Square button to cycle between visual effects. It was created by Q-Games who created the bootup waving cloth animation for the PS3 as well as 'PixelJunk Racers'. Basically it is a very high quality view of the Earth from space using various lighting and camera angles for an amazing show. It uses incredibly high quality data from the NASA Blue Marble Project compiled from hundreds of satellite passes so all of the imagery is amazingly accurate and sharp. 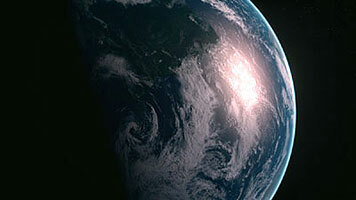 Is uses a 3D model of the Earth with accurate modelling of its atmosphere and oceans when light falls on them. I can sit and watch it for ages as the sun comes from around the edge of the planet and light bounces off the ocean. Gorgeous.